Generating reproducible and reliable results is a standard requirement in laboratories involved with the determination of pesticide residues in food. One of the challenges faced by such laboratories is instrument robustness — maintaining a consistent response when running multiple injections of complex food extracts. 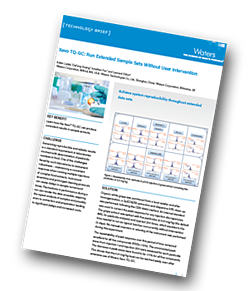 Instrument downtime and prolonged cleaning protocols can cause delays in sample turnaround times. Fluctuations in performance during a run can render the data unusable requiring the repeat analysis of samples and possibly even re-extraction and preparation leading to significant delays and increased costs. In this study, organic white grape samples were spiked with five pesticides at 0.01 mg/kg (the default MRL for pesticide analysis) and injected 200 times, which equates to the time needed to run six typical batches concurrently without intervention (5 days). No manual invention or retuning of the instrument was performed during this experiment. The repeatability of peak response over this period of time remained excellent for all five compounds (RSDs <10%). The uncorrected peak areas from injection 1 and injection 200 were assessed for each pesticide. The decrease in peak areas were found to be <17% for all five compounds. This shows that the 0.01 mg/kg level can be reached easily even after extensive use of the Xevo TQ-GC.